(Bloomberg) -- Turning Australia’s largest state into an economic powerhouse may not be enough to save the ruling Liberal-National government from losing power in New South Wales elections this weekend. Since the coalition took stewardship of the state in 2011, it has frequently topped economic indicators including growth, unemployment, construction work and household spending. Yet after becoming Liberal leader two years ago, Premier Gladys Berejiklian has been beset by problems in Sydney and beyond. A multi-billion dollar infrastructure spend on highways and public transport in Australia’s largest city has been hit by cost over-runs. Meanwhile, some regional voters in the state bigger than Texas feel they’ve missed out on the largess flowing into Sydney. 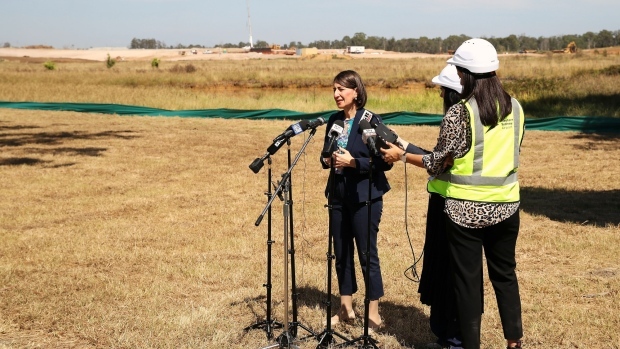 They’re also concerned with the management of a drought and water security, and disaffected by rifts within the rural-based Nationals, the junior partner in the coalition government. Polls opened at 8 a.m. local time Saturday, with the coalition leading the Michael Daley-led opposition Labor Party 51-49, according to the latest Newspoll poll conducted March 19-21 and published in the Australian newspaper Saturday. Betting markets show the government is expected to win. Sportsbet will pay A$1.38 for a winning A$1 bet on the coalition and A$3 for a Labor victory. Berejiklian’s battle to retain power reflects the fight facing federal allies in nationwide elections due in May. While state elections are predominantly fought on local issues, a bad result would reflect poorly on Prime Minister Scott Morrison’s national leadership. Like Berejiklian, Morrison hasn’t been able to put his stamp on the leadership since emerging as leader in August and is struggling to convince voters that his embattled government deserves to win a third term. The turmoil over policy direction that led to his rise is yet to be quelled, leading some New South Wales lawmakers to openly criticize federal colleagues for infighting and jeopardizing their re-election hopes. Daley’s tough last week on the campaign trail may be enough to convince previously undecided voters to stick with Berejiklian, a 48-year-old former banker. A video emerged of him warning that young Australians couldn’t afford housing because they were “being replaced by young people from typically Asia”; and the premier was deemed the clear winner of a televised debate between the party leaders on Wednesday. As treasurer of the state until former Premier Mike Baird resigned in January 2017, she can claim some credit for NSW’s strong economic performance this decade. The unemployment rate of 4.3 percent is the lowest among its state counterparts and well below the national average of 4.9 percent. Still, in recent weeks her decision to rebuild a football stadium using taxpayers’ money was criticized by Daley, 53, a former lawyer who says the money should be used to fund schools and hospitals. Berejiklian’s judgment was also called into question when she allowed advertising for a horse race to be projected on the Sydney Opera House. With polls showing the result is too close to call, the ability to form a majority government may be beyond both the coalition and Labor, and fringe parties may hold the key. An Essential Media survey conducted last month showed one in four voters will support small parties and independents, including the left-wing Greens and the far-right, anti-Muslim immigration One Nation. That could force New South Wales into its first minority government in 24 years. The coalition holds 52 seats and Labor 34, with the balance divided between minor parties and independents. More than 5 million voters will cast ballots for the state’s 93 lower-house electorates and half the 42 upper-house seats, with counting to begin from 6 p.m. Sydney time. With polls showing the race is too close to call, a final result may not be known for some days.